Species 4 or 5, natives of warm countries. Type species: Rhombolytrum rhomboideum Link. Triodia albescens Vasey, Bull. U. S. Dept. Agric. Div. Bot. 12: Part 2, 33. 1891. 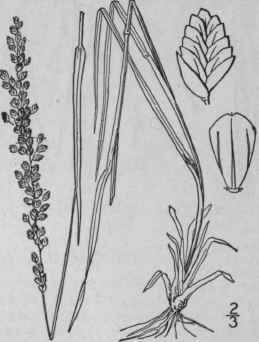 Sieglingia albescens Kuntze; L. H. Dewey, Contr. U. S.
Nat. Herb. 2: 538. 1894. R. albescens Nash, in Britt. Man. 129. 1901. Culms tufted, erect, smooth and glabrous, 12'-20' tall, the sterile shoots one-half as long as the culm or more. Sheaths shorter than the internodes, smooth; ligule a ring of short hairs; blades smooth beneath, roughish above, acuminate, 2 1/2'-11' long, 1"-2" wide; panicle dense and contracted, white, 2 1/2'-5' long, 1/4'-3/4' broad, its branches erect or ascending, 1' or less long; spikelets about 7-11-flowered, 2"-2 1/2" long, the empty scales white, 1-nerved, about equal; flowering scales about 1 1/2" long, 3-nerved, the lateral nerves vanishing below the apex, all the nerves glabrous, the midnerve excurrent in a short scabrous point, denticulate and irregularly and obscurely lobed at the truncate apex. Prairies, Kansas to New Mexico and Texas. Aug.-Sept.